Unlike them, the Guzzi foot pedals follow the modern convention of gearchange on the left, brake on the right, so riding is easier for motorcyclists used to today’s machines. New, genuine spares are available via distributors in Britain, the Continent and North America. Fasteners are to the metric standard, so in Britain and mainland Europe they and the tools to fit them are in abundance. Another plus point for those on a budget – thieves tend to pass these bikes by in search of more fashionable pickings, resulting in lower insurance premiums. Manufacturer’s weight and speed claims should be treated with caution; independent verification is advisable if these numbers are critical to you. Originally, Guzzi recommended 97 RON (Research Octane Method) leaded fuel which is now generally unavailable. 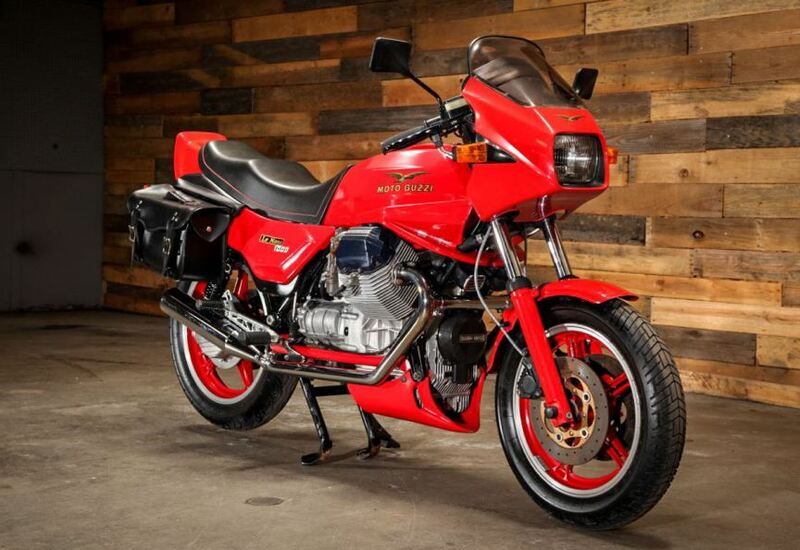 According to the Moto Guzzi website, only engines manufactured after 1992 are suitable for unleaded fuel. Its safe to assume that the few bikes made in 1993 would have been to the 1992 specification, so if you’ve got a Le Mans 1000, it was designed for leaded fuel. Lead removal raises two issues – valve wear and “knocking” (also called pinking, pinging, and detonation). The Federation of British Historic Vehicle Clubs (FBHVC) provides a useful article on this subject. In the specific case of the Le Mans 1000, what can be done about it? USA Guzzi expert Dave Richardson says do nothing. In his extremely comprehensive publication Guzziology, he suggests that American unleaded 92 AKI (Anti Knock Index), equivalent to European unleaded 97 RON, is best. Others might argue, suggesting that it might overcome the knocking problem, but the valve wear issue remains. use 95 RON fuel and add an octane booster/lubricant. The above mentioned FBHVC article lists the additives they have tested. The early (Mk IV) model had a 16” wheel. Many owners fit an 18” wheel to improve stability. If the bike topples over, the HT cap and spark plug will break. Fin protectors or crash bars are useful to minimise damage. All the information you need for regular servicing can be found in the owner’s handbook (later models have a supplement describing the changes). Moto Guzzi Le Mans 1000 Servicing Information provides a list of other technical publications, should you need more detail. However, servicing is straightforward except for ignition timing which can be awkward without Guzzi’s special tool No 14 92 70 01. I’ve managed without it so I’ve no idea how much easier it makes the task. Although the handbook describes a simple method of carburettor adjustment, it is best done with a balancing gauge. The oil filter is a screw-on cartridge type as found on most cars. But unlike most cars, you have to remove the sump cover to get to it. Unfortunately, some of the fixing screws can become corroded and may have to be drilled out. This is not as bad as it seems – the screw heads are the Allen key type so the drill bit naturally aligns to the centre of the screw. Once the head is off and the cover is out of the way, the remains of the screw can be gripped with a pair of pliers and unwound from the engine. The front engine-mounting bolt is infamous for corroding in place. It’s worthwhile, assuming it can be removed, to apply a general purpose automotive grease along its shaft at yearly intervals. If an oil leak is seen underneath the bike where the engine and gearbox cases meet, the problem could be the oil seals on the clutch push rod. The seals can be replaced with the engine/gearbox in the frame. If ignored, oil will seep onto the clutch plates which then have to be replaced. To do this, the engine/gearbox has to come out of the frame, a job that could be difficult due to the mounting bolt problem outlined above. The mechanical speedo and rev counter cables have a reputation for breaking. Keep them lubricated and as weatherproof as possible. There is an universal joint connecting the drive shaft to the gearbox, which seems to fail after about 25,000 miles. Some owners remove the joint at yearly intervals and soak it in engine oil for 24 hours, claiming that life is extended to 100,000 miles. I’ve not tried this, so I’ve no idea if it works. Listing the problems above suggests that the Le Mans is a troublesome bike. But in my experience it isn’t. With proper maintenance, it provides many years of enjoyable and reliable riding.